In late 1908, John Walter Christie set to work designing and building his last front-wheel drive race car. While the 1909 racer illustrated the continuing evolution of Christie’s front-wheel drive race cars, it also incorporated many features that were a departure from the previous racers (inline racers, 1906 V-4, and 1907 V-4). 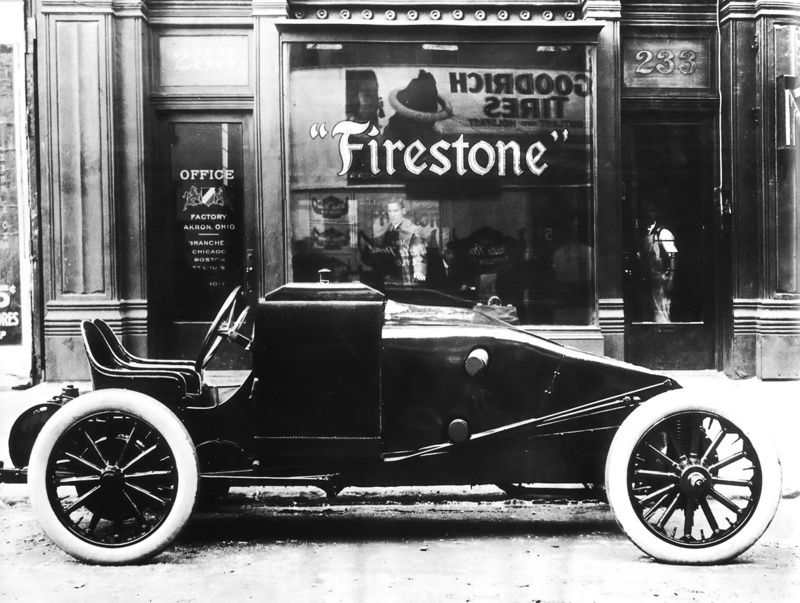 J. Walter Christie’s newly completed 1909 front-wheel drive racer in front of the Firestone office at 233 West 58th Street in New York. Note the cylindrical fuel tank at the rear of the vehicle. Like the previous racers, the 1909 car had its four-cylinder engine mounted transversely between the front drive wheels. The engine’s crankcase housed the transmission and formed the vehicle’s front axle. The cylindrical crankcase was 15.125 in (384 mm) in diameter and made of bronze. Behind the engine was a radiator shaped like an inverted “U” that extended from one side of the vehicle’s frame to the other. Above the vehicle’s rear axle were seats for the driver and passenger (or riding mechanic). The fuel tank was at the extreme rear of the car. The 1909 V-4 racer had a wheelbase around 102 in (2.59 m) and a track around 54 in (1.37 m). Although the racer was powered by a V-4 like Christie’s previous two racers, the 1909 engine was an entirely new design. Extending from the crankcase toward the rear of the vehicle was a large block to which the individual cylinders were mounted. The sides of this block were integral with the vehicle’s frame. The cylinders of the 1909 V-4 engine were angled so far back that the rear row was just eight degrees from being completely horizontal. The front row of cylinders was angled 20 degrees from the rear row. The cylinders were slanted back to improve the vehicle’s weight distribution and aerodynamics. The photo on the left illustrates the 1909 Christie racer’s cross shaft (with notched drive gears at its ends) and accessory shaft. The long shaft leading back from the accessory shaft drove the camshaft. The photo on the right shows the overhead camshaft and its drive, the rocker arms, the valves, and the intake manifold. Note the large block between the crankcase and cylinders. The forged steel crankshaft was 3.5 in (89 mm) in diameter and 19 in (483 mm) long. It had two throws and was supported by two main bearings. Attached to each crankshaft throw was one 30.5 in (775 mm) long (center-to-center) master connecting rod. The master rods served the rear row (lower) cylinders. Attached 7.0 in (178 mm) above each master rod’s big end was a 23.5 in (597 mm) long (center-to-center) articulated connecting rod. The articulated connecting rods served the front row (upper) cylinders. The incredibly long connecting rods allowed the mass of the engine to be placed toward the rear of the car in an effort to further equalize the vehicle’s weight distribution. The engine’s cylinders had a 7.5 in (191 mm) bore and 7.0 in (178 mm) stroke, which gave the engine total displacement of 1,237 cu in (20.3 L). The engine’s output has been given as various numbers from 100 to 300 hp (75 to 224 kW), but 200 hp (149 kW) is probably close to the correct number. Each cylinder had one intake and one exhaust valve—both were 3.0 in (76 mm) in diameter and mechanically operated. The intake valves were placed on the inner side of the cylinders so that a common intake manifold could feed each row of cylinders. The upper and lower intake manifolds joined at the center of the engine, and the Christie-designed carburetor was bolted to the lower manifold. 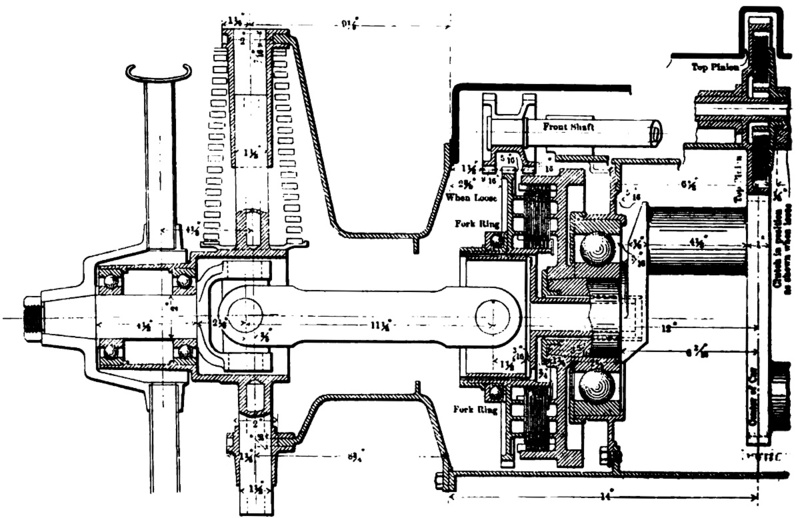 Sectional drawing of the 1909 Christie V-4 racer’s crankcase with normal, high-speed drive engaged. The short drive shaft with universal joints on its ends can be seen coupled to the engine’s crankshaft. The front cross shaft is shown with its notched gear straddling the gear of the inner universal joint. The exhaust valves were on the outer side of the cylinders and positioned so that the exhaust gases for each cylinder vented through a small stack. The valves were actuated by separate rocker arms driven by a single overhead camshaft situated between the two cylinder rows. The camshaft was driven via beveled gears by a long shaft on the left side (from the driver’s perspective) of the engine. The long shaft was driven from the left side of an auxiliary shaft positioned above the engine’s crankcase and in front of the cylinders. A single spark plug was installed in each cylinder and just under the intake valve. In order to achieve proper timing with the odd cylinder angles, the spark plugs for each row of cylinders were fired by separate magnetos. The magnetos were driven from the extended end of the same long shaft that drove the camshaft. For normal, high-speed front-wheel drive operation, each end of the crankshaft was coupled via disk clutches to a short drive shaft with universal joints at each end. The short drive shaft was constructed of solid steel and was 2.25 in (57 mm) in diameter. The spindles for the drive wheels were on the outer ends of these shafts. In this configuration, the drive wheels turned once for each revolution of the engine. 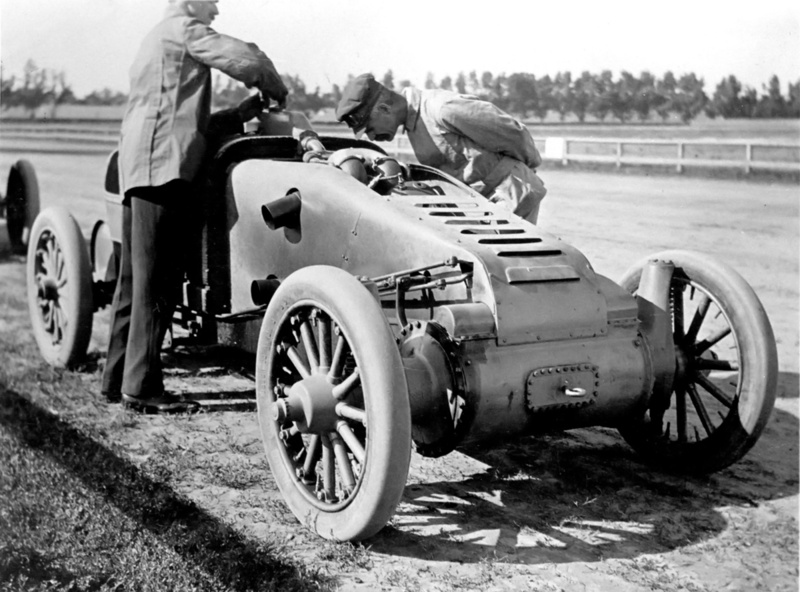 The 1909 Christie V-4 racer undergoing final checks before a run. Walter Christie is checking the water level in the radiator’s header tank. Note the thick radiator and the exhaust stacks protruding from the engine cowling. Machined between the throws at the center of the crankshaft were 1.0 in (25 mm) wide spur teeth that drove the auxiliary shaft positioned above and slightly to the rear of the crankcase. Positioned in front of and driven by the right side of the auxiliary shaft was a cross shaft. This cross shaft could slide to decouple the drive wheels from the crankshaft and engage a reverse gear. In addition, the cross shaft could engage a low-speed gear via an intermediate gear. Each end of the cross shaft had a notched gear that could mesh with teeth on the inner side of the short drive shaft. For normal, high-speed operation, the notch would align with the teeth on the short drive shaft, allowing for direct drive. For low-speed operation, the cross shaft would slide left, and one side of the notched gear would engage the teeth on the short drive shaft. For reverse, the cross shaft would slide right, mesh with the intermediate gear, and the other side of the notched gear would engage the teeth on the short drive shaft. Shifting levers operated various forks that slid the cross shaft and engaged or disengaged the clutches. Walter Christie driving the 1909 V-4 racer on Dayton-Ormond Beach in Florida with George Robertson holding on. For the beach runs, special cowlings were installed, the passenger seat was removed, and the radiator’s header tank was altered. The radiator was formed from 80 copper tubes in 10 sections. Five sections were positioned on each side of the vehicle, and the eight copper tubes of each section formed a half arch. The copper tubes were flattened to a width of 2.625 in (67 mm) and extended from one side of the vehicle’s frame to a header tank positioned at the upper center of the radiator. The complete radiator was 29.25 in (743 mm) high, 35 in (889 mm) wide, and 32.5 in (826 mm) long. Three different tires sizes were intended to be used on the 1909 racer: 30 in (762 mm) tires for circle tracks, 32 in (813 mm) tires for road use, and 34 in (864 mm) tires for high speed operations. 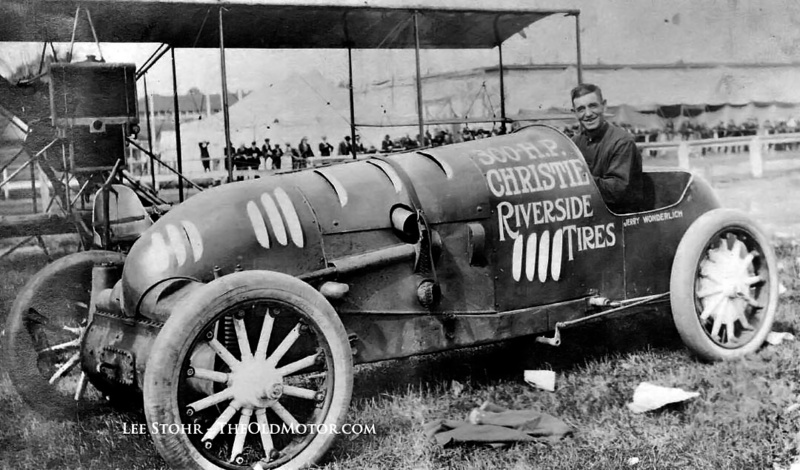 Christie estimated his racer was capable of 130 mph (209 km/h), which equates to an engine speed of 1,285 rpm with the 34 in (864 mm) tires. Christie proposed that an engine with a smaller bore of either 5.5 in (140 mm) or 6.0 in (152 mm) could be used in a touring car version of the racer. These bores would give engine displacements of 665 cu in (10.9 L) and 792 cu in (13.0 L) respectively. However, it is doubtful that engines of these sizes were ever made. Barney Oldfield in the 1909 Christie racer at one of the many race exhibitions he staged. By this time, the racer had a new radiator and a square fuel tank. The dangerous aspects of the racer were embellished by Oldfield and subsequent owners; the car was even called the “Killer Christie.” It is safe to assume that no car in the 1910s was safe at over 100 mph (160 km/h). Christie’s new V-4 racer made its public debut on 8 July 1909 at the Blue Bonnets track in Montreal, Canada, but Christie did not find the success he had hoped for. Experiencing some engine trouble, he was able to run a 59.6 second mile (60.4 mph / 97.2 km/h) on the circle track. In the next race, Christie’s car caught fire, taking him out of the event. In early August, the car ran at Grosse Pointe, Michigan where Christie ran a 54.6 second mile (65.9 mph / 106.1 km/h)—a new record for that circle track. Christie’s speed was limited by the track’s insufficient banking, which resulted in him coasting through the turns. For the remainder of 1909, Christie raced at several tracks but was always plagued by trouble. On the Indianapolis Motor Speedway in mid-December, Christie ran a half mile in 17.53 seconds (102.7 mph / 165.2 km/h). He was slowed again by the turns, completing a mile in 42.58 seconds (84.5 mph / 136.0 km/h). Christie’s former partner (and nephew) Lewis Strang ran a few seconds faster in his 200 hp (149 kW) FIAT. Oldfield on the Ascot track in Los Angeles, California leading Lincoln Beachey in his Curtiss Pusher in 1913. George Robertson was hired to drive Christie’s V-4 racer at Ormond-Daytona Beach, Florida in March 1910. The car was fitted with special, aerodynamic front and rear cowlings, and the passenger seat was removed. While the racer did a respectable 32.36 second mile (111.2 mph / 179.0 km/h), it could not approach the 27.33 second mile (131.723 mph / 211.988 km/h) Barney Oldfield had previously run in the 200 hp (149 kW) Blitzen Benz. Robertson went out to make another attempt despite the Christie racer constantly overheating. In the middle of what he felt would be a record-setting run, the engine seized. Once the engine stopped, the drive wheels froze and slid along the sand. This destroyed the tires and damaged the wheels. After much work to repair the vehicle, overheating issues and carburetor problems continued to plague the racer. Christie had grown tired of all the issues with his racer. He announced that he was done racing and exited the automobile business altogether. The V-4 racer sat until 1912 when Oldfield bought it for $750. A new radiator was installed by either Christie or Oldfield, and the original body was put back on. Oldfield campaigned the car for four years, putting on show after show. For some of his exhibitions, Oldfield raced against aviation pioneer Lincoln Beachey in his Curtiss Pusher airplane. Oldfield did achieve some success, setting a number of records with the Christie racer. On 20 June 1915, Oldfield set a new American record when he lapped the 2 mile (3.2 km) Speedway Park track in Chicago, Illinois in 64.6 seconds (111.5 mph / 179.4 km/h). 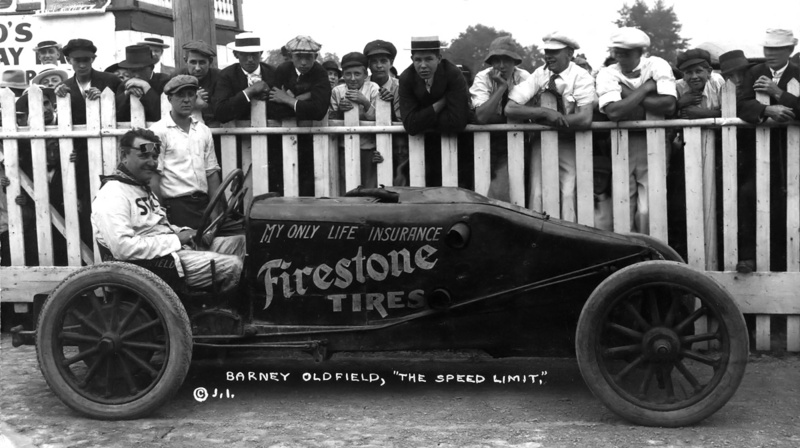 On 28 May 1916, Oldfield became the first person to exceed 100 mph (161 km/h) on the 2.5 mile (4.0 km) Indianapolis Motor Speedway track when he completed a lap in 87.7 seconds at 102.623 mph (165.156 km/h). He then upped his 2 mile (3.2 km) American record in Chicago on 5 June 1916 when he completed a lap in 63.75 seconds (112.9 mph / 181.8 km/h). 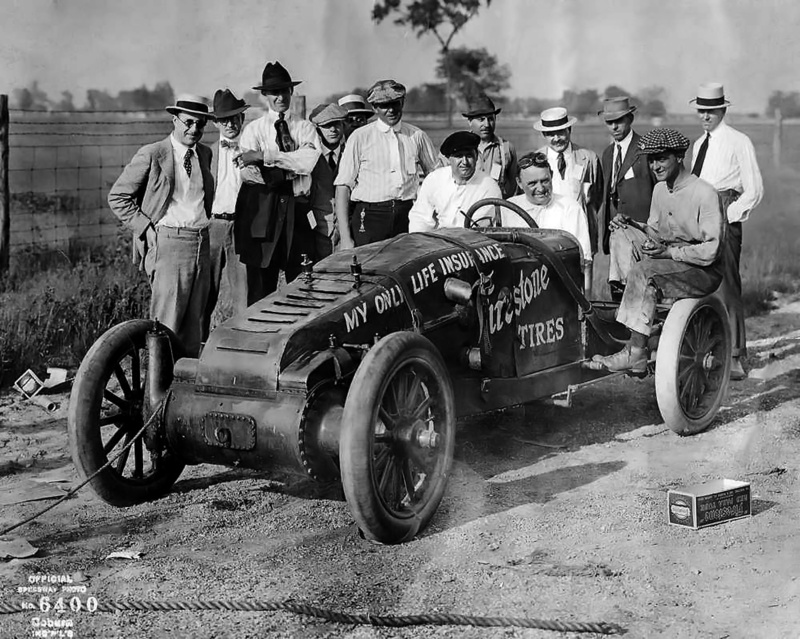 Oldfield and his crew by the Indianapolis Motor Speedway for their record-setting run in 1916. Leather straps are now used to secure the racer’s cowling, and what appear to be grease cups protrude from the cowl. Damaged during the run in Chicago, Oldfield sold the car mid-June 1916. The Christie was then used in Ernest Moross’ traveling auto race shows. During World War I, the Christie racer and the rest of the show toured Canada. At some point during this time, the racer was fitted with a new cowl and body. In March 1918, the car was sold to racer Louis Disbrow and continued to be used in various shows. Some of the shows included driver Jerry Wonderlich racing against aviatrix Ruth Law in her Curtiss Pusher aircraft. Outdated and unwieldy, the last of Christie’s front-wheel drive racers was scrapped in Chicago, Illinois around April 1919. All of the bronze parts proved to be the racer’s last payout: $450. After parting with his racer in 1910, Christie had a short stint in aviation. He then built a series of front-wheel drive fire trucks. These trucks replaced the horses of existing horse-drawn units. This business venture proved quite lucrative. Christie then moved into designing tanks, which occupied his remaining days. Unfortunately, the money faded as the years went by, and Christie died nearly broke on 11 January 1944. This entry was posted in Automotive on 22 December 2014 by William Pearce. Thank you for the kind words. The more I learn about the early pioneers, the more amazing it all is.